Will I Ever Be Free of You? 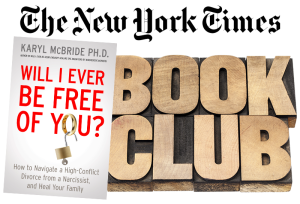 How to Navigate a High-Conflict Divorce from a Narcissist, and Heal Your Family was featured in the New York Times Book Club August 24th through August 31st, 2015. Click Here for all of Dr. McBride's interviews and Q&A sessions. More recovery talk! Pop in and join us on Facebook for author interviews and more! Click below for information about Dr. Karyl McBride's published books plus details on where you can purchase a copy. Healing the Daughters of Narcissistic Mothers Virtual Workshop. Healing exercises available when you need it. Do you feel like the lone ranger in your family? Listen to this inspirational story, learn to believe in yourself, and stand strong in the face of your truth. Receive news, announcements, blog posts, and free resources about once a month. You can unsubscribe at anytime.